This is a bizarre little LFO that produces a wide range of pseudo random effects. It is essentially a reworked version of Ken's 1984 "fluorescent simulator" for model railways, and came about when he was wondering what he could do with a left-over PCB from this project. The effect was so good, he designed a PCB specifically for it. The circuit consists of several distinct blocks. The first is the collection of square wave oscillators, three of which run at fixed though different frequencies. The fourth is variable between much slower than the others to much faster than the others. These oscillators are all based on single schmitt trigger stages of a CMOS 74C14, 40106 or similar. The second block is a traditional op amp inverting mixer stage. Signals from the four oscillators are mixed through 560k resistors, the overall gain controlled by a 100k pot in the feedback path of the op amp. What is interesting here is that in order to keep the output signal of the mixer positive without the need for an additional inverting stage, the chip used to build the four oscillators is powered from the negative rail, it's positive power pin connected to 0V and its earth pin connected to -15V. Take special note of this, because it is an unusual way to power a digital chip, and inadvertent poking with a logic probe powered from the positive rail could cause you grief! The third stage is a simple glide circuit consisting of a potentiometer, a capacitor and unity gain voltage follower. The glide range is quite adequate with a 100k pot, though some might like to experiment by putting an larger value here. The switch is to allow easy switching in and out of a preadjusted glide setting. It can be omitted, and a link soldered in its place on the circuit board. Ken's prototype had the switch, though the modules he has made since do not. The power supply is decoupled using a pair of 22 ohm resistors and 10uF capacitors. The two unused sections of the chip are tied as per good CMOS practice. The schematic of the Psycho LFO. The overlay of the Psycho LFO. A different effect can be achieved if the four 560K resistors are replaced with differing values. Try a 1R, 2R, 4R, 8R set, where R is at least 100k. You may need to reduce the value of the level pot if you do this. Want it to run slower? Try increasing the 2.2uF capacitors in the oscillators to 4.7uF or even 10uF. Remember, the digital chip (40106) is powered from the NEGATIVE rail in this project. 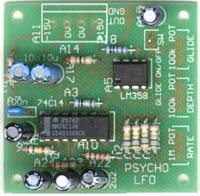 Take care if connecting a logic probe or if adding external logic for whatever reason.